The Mat-Su Valley has four golf courses centrally located near Wasilla and Palmer. Much like all of Alaska, the views from these golf courses are amazing, and thanks the Midnight Sun, you can almost tee off at any time. Approximately 10 miles north of Wasilla is Settlers Bay Golf Course, which typically opens in late April and boasts "Alaska best putting greens." 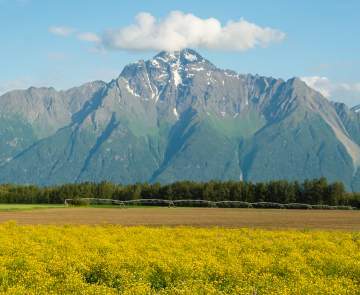 The 18-hole course provides golfers fantastic views of the Chugach Mountains and Cook Inlet. Complete with a driving range, full on-site restaurant and clubhouse, Settlers Bay Golf Course is a must-visit for golfers traveling to Alaska. As a bonus, the course also has RV hook-ups, so you can take advantage of those long summer nights and have a place to stay. Palmer Golf Course is located off Inner Springer Loop and features 18 breathtaking holes with views of the Chugach Mountains, the Matanuska River and Knik Glacier. They offer a snack bar as well as a full pro shop. Both Palmer Golf Course and Settlers Bay Golf Course host tournaments throughout the summer. Two smaller courses are also options for golfers. Fishhook Golf Course was created out of a hay field. The nine-hole course is located on Palmer-Fishhook Road, near Palmer. Sleepy Hollow Golf Course, located off Wasilla-Fishook Road, is also a nine-hole course, but all holes are par-3. Both Fishhook and Sleepy Hollow are small, family-run golf courses. 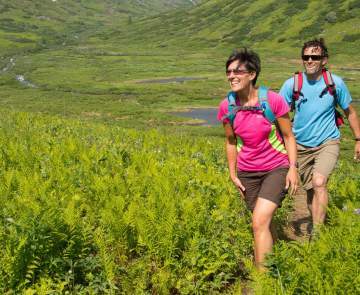 With spectacular views and endless nights, golfing in the Mat-Su Valley is a great experience you don&apos;t want to miss.